So as we come to the end of our overview of the smartphone world (which has included the Blackberry Storm, Blackberry Bold, Nokia E71, HTC Touch HD and the iPhone 3G) and we meet the T-Mobile G1 – The first Google Phone! This has got to be the only phone where the operating system (O/S) has created more interest than the phone. Having said that the phone has been the centre of much attention and not all of it is without good reason. 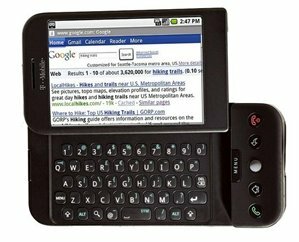 Firstly a little background: the phone is technically called the HTC Dream (you may recognise HTC from their Touch HD) as they, along with some input from Google’s design team, designed the hardware. But what makes this phone special is that it is the first example of Google’s Android O/S which promised to be stylish, packed with features and built completely with touchscreens in mind; so it looked good, but the end result was a phone of two halves. This is the first our mobile phones that use both a physical QWERTY keyboard and a touchscreen but although you would have thought this would be perfect, however, it does have several bad points. Firstly the fact that the screen slides out means that it does not feel quite as solid as it could especially when it vibrates. Secondly, there is no touchscreen keyboard option which means that you have to slide open the keyboard every time you want to type, even quick text messages. Having said that the Google Android O/S works really well, the large icons make it very easy to navigate and although the screen is sometimes a little inaccurate when there are lots of small links it is generally very good. The integration with all the Google applications is also nice allowing you to easily access the mail, calendar and maps features. Irritatingly there is no note taking function but the five physical buttons are convenient (if a little childish) and the trackball is also very useful. I’ve already mentioned that the O/S has several good features regarding Google applications, but there are many others that look really good. Firstly there is the ShopSavvy which turns the ropey 3-megapixel camera into a barcode scanner which allows you to identify the product in question and compare the price to those on the internet as well as local stores – and of course, you can then use Google Maps to navigate you there. BreadCrumb, Google Maps Street View and One Touch search are also very neat but the highlight is the Android Market which opens up a wealth of possibilities for developers to create custom apps. One of the best that I have seen is Wikitude (shown right) which uses the GPS and compass to identify your location, and then uses the camera to identify landmarks. This can then be manipulated allowing you to look up Wikipedia entries on what you can see in your camera – a truly universal travel guide! – A great early example of ‘augmented reality’, no doubt they’ll be lots more uses for this in future. On the hardware side it comes with the standard variety of connection methods: HSDPA, Wi-Fi and GPS are all included but for the latter, you will have to rely on the T-Mobile 3G service which is at best patchy. Whilst the O/S is very impressive the actual phone design leaves much to be desired; the first thing you will notice (besides the aforementioned flimsy sliding screen) is how clunky the phone is – it is the tallest, widest and thickest phone that we have looked at by far. The buttons are also very plastic-y and although the keyboard is by no means poor, it is nowhere near the standards set by the Blackberry Bold. Having said that you can get to like the retro (however unintentional) look and even the ‘chin’, which can get in the way of typing, can be liked. The smooth edges leave a nice finish and it is refreshing to see the focus on functionality with regards to buttons as opposed to the one button minimalistic option. Unfortunately, this is another section which the T-Mobile G1 falls down on: it comes with an extortionate price tag of £720, which really is high. This is easily the most expensive smartphone that we have looked at, and to be honest you would struggle to find any phone more expensive than that, and unfortunately, the build quality and array of features isn’t quite good enough to merit this high price. Just when you thought the hardware couldn’t get any worse you realise that the phone has died, because it has a measly 31-hour battery life (in the light use test) which is just under 4 times less then what the HTC Touch HD can manage. At the beginning of this review I said that this was a phone of two halves, and it I think it is fair to say that that comment stands true. The Android O/S is wonderful to use, the way that it has been programmed makes it very easy to use on touchscreens and it is adorned with loads of fun and useful applications. However, the hardware lets it down with very poor pricing and battery life, with a clunky design which at times can be irritating to use. But despite the fact that this T-Mobile G1 mobile phone may not compete with the big guns as it promised it still holds lots of promise for the future and I for one can’t wait until we see the Google Android O/S in a better mobile phone handset; let’s just hope that they learn from the G1’s mistakes. UPDATE: With the recent Android v1.5 update release, the G1 mobile phone now has an on-screen keyboard in addition to the hardware keyboard.